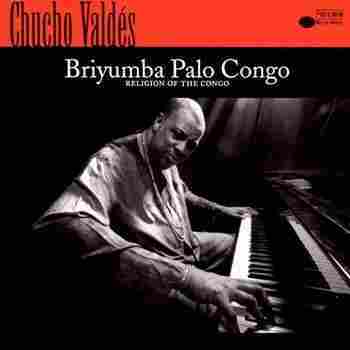 Chucho Valdes: 'Briyumba Palo Congo' Delayed for a U.S. release because of its Cuban connections, Briyumba Palo Congo transforms the sounds of Havana into classic jazz. Recorded by Chucho Valdes, the album frequently pays homage to Gershwin and Ellington. Don't miss the swinging Latin version of "Rhapsody in Blue." MURRAY HORWITZ, American Film Institute: There is a whole lot of rhythm going on in that piano playing. A.B. Spellman, this is Jesus "Chucho" Valdés of Cuba. Tell us why it needs to be in the NPR Basic Jazz Record Library. A.B. SPELLMAN, National Endowment for the Arts : Well, Murray, Cuba has contributed a lot to jazz from the very, very beginning. And, now we have a group of musicians coming out of Cuba, who are as strong as anyone playing the music. I think this is particularly true of the piano, with Gonzalo Rubacaba and Jesus Chucho Valdes. Chucho is a musician, who has so much virtuosity, and so much musicianship that it takes a lot of listening to find out everything that he's doing. And he has on this record, I think, come together and used the liturgical music of the Congolese retentions of Cuba, and formatted that into a musical piece that is just beautiful to behold. HORWITZ: There is so much going on in this record, I mean, especially rhythmically. He has polyrhythms — that is to say, many voiced rhythms — going over other polyrhythms. And then sometimes, he will just stop his rhythm section from playing, and he will play solo and he still got all of those rhythms going. SPELLMAN: I think if you listen to this excerpt from the piano solo, "Briyumba Palo Congo" or the "Religion Of The Congo," what you are saying will be exemplified. HORWITZ: He's certainly has absorbed all kinds of musical influences. There's a great diversity of repertory on this disc. He's got the great Duke Ellington/Juan Tizol — another Latin musician — composition, "Caravan." SPELLMAN: And that is a very interesting interpretation because, even though Chucho plays a very sort of slow and moderate piano solo over it, the rhythmic intensity underneath it is so deep that it is hard to tell whether he's playing fast or slow. HORWITZ: And he plays a Gershwin classic in his own inimitable style. SPELLMAN: This is a "Rhapsody In Blue," the likes of which you have never heard before —a swinging Latin version of 'Rhapsody In Blue,' and it sounds perfectly natural. HORWITZ: And because of that kind of virtuosity, and that kind of expression, we are recommending Chucho Valdés' Briyumba Palo Congo (Religion Of The Congo). It's on the Blue Note label. For more information about it and the other selections in the NPR Basic Jazz Record Library, visit our Web site. For NPR Jazz, I'm Murray Horwitz.